Introduction to the Huetiful Hair Steamer, its History, and its Founder. Includes a product demonstration and information on the Huetiful Salon. By Nina Christmas, Creative Director, Huetiful Salon Follow Nina's Instagram @nina_huetifulsalon Getting the most value out of your blowout / silk (flat iron) press should be an everyday desire of a salon client. The best way to do this is to maintain or take care of your hair after you've left the salon. While Hueti- ful is a natural, textured hair salon, slightly more than 50% of our clients leave the salon with thermal or heat straightened hair. That is hundreds of clients every month. 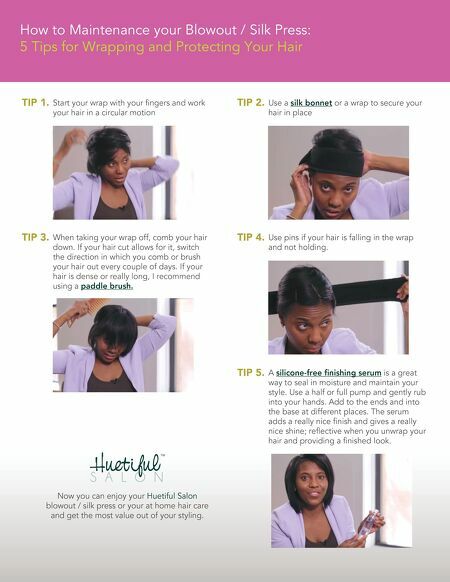 Based on our experience, this is the best way to wrap and protect your hair after a blowout or silk press. My professional recommendation is to wrap your hair. Wrapping is a great way to minimize frizz, maintain the structure of the straightened hair, and make follow-up styling easier. It gives your hair, the following day, the opportunity to look as it did the previous day – thereby providing more value to your salon blowout / silk press. Watch the video to see several tips on how to maintain your blowout / silk press and get the most value out of your service or at home styling. While a picture is worth a thousand words, the video is worth a thousand pictures. How to Maintenance your Blowout / Silk Press: 5 Tips for Wrapping and Protecting Your Hair Video available at YouTube Channel: "Huetiful" To read about how to Maintain your Blowout / Silk Press please turn to page 2. Click to view our Huetiful Salon Blowout / Silk Press photo gallery.